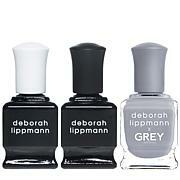 For better results, apply 2 thin coats of color and allow the polish to dry at least 1 minute between applications. 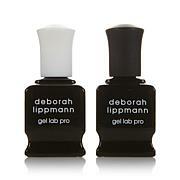 For maximum results, use Deborah Lippmann Gel Lab Pro Base and Top Coats (sold separately). Ingredients: Butyl Acetate, Ethyl Acetate, Nitrocellulose, Acetyl Tributyl Citrate, Phthalic Anhydride/Trimellitic Anhydride/Glycols Copolymer, Isopropyl Alcohol, Adipic Acid/Fumaric Acid/Phthalic Acid/Tricyclodecane Dimethanol Copolymer, Stearalkonium Hectorite, Dibutyl Adipate, Trimethyl Pentanyl Diisobutyrate, Citric Acid, Carthamus Tinctorius (Safflower) Seed Oil, Copernicia Cerifera Wax, Hydrolyzed Corn/Soy/Wheat Protein Thioglycolamide/Thiopropionamide, Biotin, Water/Aqua/Eau (And) Camellia Oleifera Leaf Extract, Glycidoxypropyl Trimethoxysilane/Methacryloyl Propyltrimethoxysilane/Methyltriethoxysilane /Mercaptopropyltrimethoxysilane, Hydrolyzed Rice Protein, Nylon-12, Oenothera Biennis (Evening Primrose) Flower Extract, Bambusa Vulgaris (Bamboo) Extract, Aucoumea Klaineana Resin Extract, (+/-) (May Contain/Peut Contenir): Iron Oxides (CI 77499, CI 77491), Red 34 Lake (CI 15880), Titanium Dioxide (CI 77891), Red 6 Lake (CI 15850), Yellow 5 Lake (CI 19140) . Ingredients: Butyl Acetate, Ethyl Acetate, Nitrocellulose, Acetyl Tributyl Citrate, Phthalic Anhydride/Trimellitic Anhydride/Glycols Copolymer, Isopropyl Alcohol, Adipic Acid/Fumaric Acid/Phthalic Acid/Tricyclodecane Dimethanol Copolymer, Stearalkonium Hectorite, Dibutyl Adipate, Trimethyl Pentanyl Diisobutyrate, Citric Acid, Carthamus Tinctorius (Safflower) Seed Oil, Copernicia Cerifera Wax, Hydrolyzed Corn/Soy/Wheat Protein Thioglycolamide/Thiopropionamide, Biotin, Water/Aqua/Eau (And) Camellia Oleifera Leaf Extract, Glycidoxypropyl Trimethoxysilane/Methacryloyl Propyltrimethoxysilane/Methyltriethoxysilane /Mercaptopropyltrimethoxysilane, Hydrolyzed Rice Protein, Nylon-12, Oenothera Biennis (Evening Primrose) Flower Extract, Bambusa Vulgaris (Bamboo) Extract, Aucoumea Klaineana Resin Extract, (+/-) (May Contain/Peut Contenir): Iron Oxides (CI 77499, CI 77491), Red 34 Lake (CI 15880), Titanium Dioxide (CI 77891), Red 6 Lake (CI 15850), Yellow 5 Lake (CI 19140). Ingredients: Butyl Acetate, Ethyl Acetate, Nitrocellulose, SD Alcohol - 40B, Isopropyl Alcohol, Adipic Acid/Neopentyl Glycol /Trimellitic Anhydride Copolymer, Triphenyl Phosphate, Trimethyl Pentanyl Diisobutyrate, Polyethylene Terephthalate , Acrylates Copolymer, Silica, Polyurethane-11, Carthamus Tinctorius (Safflower) Seed Oil, Copernicia Cerifera Wax, Hydrolyzed Corn/Soy/Wheat Protein Thioglycolamide/Thiopropionamide, Biotin, Water/Aqua/Eau (And) Camellia Oleifera Leaf Extract, Glycidoxypropyl Trimethoxysilane/MethacryloylPropyltrimethoxysilane/Methyltriethoxysilane/Mercaptopropyltrimethoxysilane, Hydrolyzed Rice Protein, Nylon-12, Oenothera Biennis (Evening Primrose) Flower Extract, Bambusa Vulgaris (Bamboo) Extract, Aucoumea Klaineana Resin Extract, (+/-) (May Contain/Peut Contenir): Yellow 5 Lake (CI 19140), Red 6 Lake (CI 15850), Red 7 (CI 15850), Violet 2 (CI 60730), Aluminum Powder (CI 77000). Gave this great color combo as a gift and it was a big hit. This is by far the best polish on the market. I really love the new Gel Lab Pro polishes. Love the ease of use, the staying power, the colors & the shine. Good stuff! The smaller bottle collections allow me to try multiple colors in one purchase, then I buy the larger bottles of my favorites later. There's still plenty in these bottles! 5-stars! 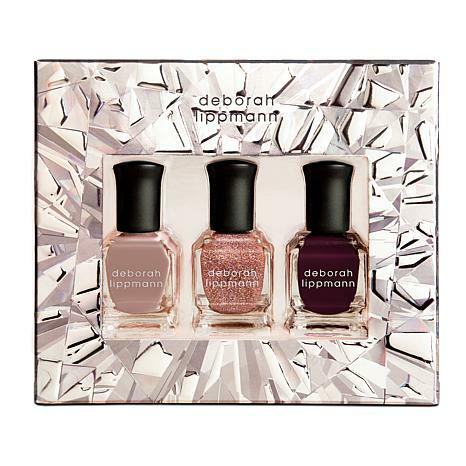 I was so excited to receive my nail polish and could not wait to use it. I love the colors but was very surprised by how small the product actually was. Also, extremely hard to open bottles. the bottles are very tiny like samples ! they should be larger for the price ! I do like the colors but haven't used it yet !